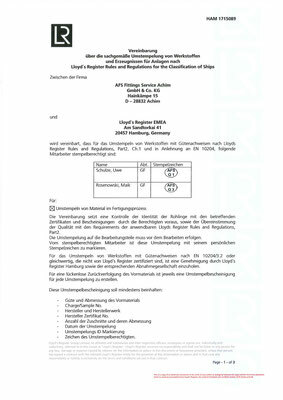 Equipment Directive (2014/68/EU) and monitored according to AD 2000 - W0 by TÜV Nord Systems GmbH & Co. KG waived of counter-signature. Therefore we can issue certificates acc. to EN 10204/3.1 right after production. Our company is an approved manufacturer by Lloyd`s Register and is authorized for stamping in the manufacturing process. Our quality management is monitored frequently by external audits acc. to ISO 9001.